Ever dreamed of becoming a champion with the Earth as your stage & people from all Nations watching you with avid delight? This is no Cinderella story; it doesn’t end when the clock strikes midnight. It’s the real deal! It’s precise, it’s concise, yet so rich. I Have a Great Future is the diet of great men. Greatness isn’t stumbled upon, it’s as a result of well-planned, consistent and intentional activities that culminate in success. 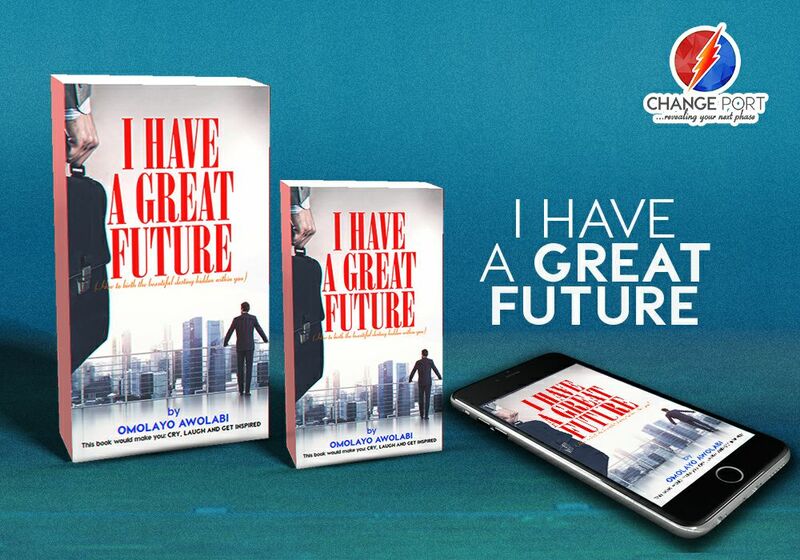 Pick up a copy of I Have a Great Future today and join the league of extraordinary generals. The world awaits you! Title: WHO WOULD HELP ME? As early in life as it was when I turned sixteen, I didn’t need anyone to remind me that I was a failure; it was just glaring. School studies were unfruitful, complaints came to my parents about me from almost everyone; neighbours, teachers, family friends, and just about everyone who knew me. They all had something to say. Deep within me were great feelings of dissatisfaction. I remember two unsuccessful attempts I made to take my life. I really wanted things to play out differently but I didn’t know what to do or how to change things. Concerned persons around me wanted a change for me and many times made efforts but most didn’t seem to have the right codes. Many of them gave up on me and just concluded I had chosen my own path in life, but I was later going to realize that when people give up on you, it’s often because your uniqueness is too special for them to handle. I direly wanted a new life too, but the painful thing was I didn’t know what to do or how to go about making the change. I felt terribly hopeless. My Parents always did their best to provide my siblings and I with a good life, excellent education, and other basic necessities, but I just always wanted more, like Oliver Twist. My earliest remembrance of that name was from my Mum, she often said I was like the boy in a number of ways- nothing just seemed to be enough. Once, just as a sixteen year old, I left home in annoyance, concluding my parents weren’t doing their best. I thought it would be better to struggle on my own. I decided to quit school temporarily. I traveled far to another state. I went on a lorry hoping to one day tell the tale of how I rose from nothing to something by myself. I ran away from home to make a living and be a man. I returned only after two days. Life in the outer world was harsher than I had imagined. At sixteen, I had been introduced to many of the multiple influences that prevailed at the time. My future looked very bleak and I often wondered what would come out of my life. I wondered who I would be at age forty if things continued that way. The foundation for this situation was however laid several years before. I never mentioned it to anyone, but one of the greatest fears in my heart as a boy was the fear of growing up. I dreaded it. I began to become aware of myself and my environment as a child at a time when economic circumstances in my country took a downward turn. Many people complained about the hardship, the unbearable increase in the cost of daily needs, and the basic essentials the human soul delights in. I remember hearing adults around me complain about the stress and hardship as early as age four or so. Looking back, I am sure nobody knew it, but all the negative things I heard built a massive stronghold of fear within me. Every time I heard the complaint about the cost of rent, transportation, paying school fees, and all the sorts, even as a child, my heart skipped. One of the best things you can do for a child is to help her protect her mind from an early stage in life. As an adult, your key assignment throughout any crisis is the control of your mind. I barely could. The fears were too strong and almost everywhere I turned, they were playing out. The big concern in my heart was this: if things were this expensive while I was this young, I wondered how much they would cost when I grew up, and much more, I wondered if I would be able to afford them. I heard too many people around me, even couples in the neighbourhood, fight because of insufficient funds. The fears I felt as I grew up dated back to that early period. In the mind of the adults around me, the events might have seemed insignificant to me, but their effects were amazingly enormous. Growing up as a boy, Samco was the major ice cream kids took, and at the school I attended, each pupil was entitled to one sachet per day. The Samco experience was usually one you didn’t want to end, as the vanilla flavour buried in milk and eggs went down your throat in the harsh heat of the Sun in a typical African suburb. Sure enough, just like every sweet meal ends, the sweet experience of my refreshing Samco always soon came to its end. Of course, there was often the desire to buy more as more, and was actually available for sale but the issue was I never had that kind of extra cash on me. I was just about 8years old. I usually just got cash for a snack besides the lunch I took to school. So I was originally never entitled to another round of Samco. The trouble was, there were a lot of Children around me who could buy three or even four more, enjoy themselves and not even care a thing about you. I remember how sad and terrible it felt to see your mates have what you wanted so easily and it was so far from your reach. It just sometimes gave a feeling that one was destined to loose. Other sickening situations occurred almost every time I went to Church. My first vivid experience with Church was in an assembly my parents attended. It was in a neighbourhood where a lot of rich people lived and a lot of these fellows came to that particular Church with their Children. I often dreaded Sunday school. I didn’t have the type of clothes that many of the rich kids wore to Church and this made me feel a lot less than them. I hadn’t yet known that when it really matters, our clothes don’t determine who we are but ultimately who we are determines the value of what we wear. At this time I craved to wear the hip things like every child seemed to do. It was in this mental frame I began to grow up. The natural result was a terribly low self-esteem. I badly needed people’s approval and acceptance to feel like a human being. If a person looked like they had something I didn’t have, I concluded they were better and would be more successful than I was. I thought their destiny was better than mine and so many other terrible feelings like these. The negative experiences I had with fear from childhood and the resultant failures they produced, further drove me to terrible extents. I think I should save some gory details of these periods till you watch a replay of my life in heaven. Nevertheless, these experiences never made me have much confidence in me and they consistently made a great fear for the future reign in my heart. The problem with this whole thing was that feelings like this became the basis for attracting more terrible dimensions of failure to one’s life; I experienced a lot more. Problems can be very magnetic. I have learnt to solve negative situations quickly; they have a way of breeding fast when untamed. The greatest enemy I fought in those days was the fear of tomorrow. I wondered where I was headed; I wondered who I would become. Was there a place for me in the world? Or was my place already taken by one of those that was better than me? Would I one day be celebrated like the great men I saw on the television and in the newspapers? Would I be able to own my own house and would my name matter to any one at all? These were the fears and questions that came up in my heart. In the midst of all I was going through, I kept making efforts to record progress somehow. I just wanted to be moving forward, but after a few slaps and disappointments from life, I soon discovered that your fears and needs may initiate enterprising activities, but only a rebirth by higher energy would deliver your dream. Maybe you were born into a family of meager means, so you didn’t get the kind of opportunities you would have desired to have or you were probably born sickly and the condition seems to have delayed you a lot in life. The central message of this book is that GOD still has a future prepared and hidden for you, that neither the devil nor circumstances have ever known. In Jeremiah 1:5; GOD told Jeremiah that before he was formed in his mother’s womb, HE knew him and ordained him a prophet to the nations. This book is about the unveiling of that Glorious plan of GOD for your life that you probably have never heard of or known a thing about at all. Things may have been very bad for you or perhaps even terrible, but this isn’t just the time to give up. Something good is about to happen in your life in this season. I’m serious. I know what I’m talking about. Something is about to happen that would change your entire life. Today, I am excitedly enjoying my life. I have become so bold on every side and I’m very able to do the things that GOD made me for and has asked me to do. Today, I have my own family, I’m leading nations, I can afford what I desire. Today, I have a testimony that can never compare to where I used to be. I wrote this book as a testimony of my life to show you what GOD can do for you too. Most especially, I wrote the book to help you understand how to make the change in your own life. This book contains the instructions for standing up from being a mediocre in life to moving into your GOD given destiny to accomplish all you were made for. Just like in my case, I am convinced that the same principles I discovered that gave me hope would give you hope and deliver your future to you. You would suddenly realize that amazingly, our biggest fears become platforms for greatness when we dare to involve the divine. How then did my life change? And how can the lessons learnt help you change yours too? Come with me as we unveil these truths. Omolayo Awojobi was trained in Law at the Olabisi Onabanjo University in Nigeria. He equally holds qualifications in leadership and organizational management but has since found his place as an Apostle in GOD’s last days agenda on earth. He serves as the Overseer of GOD’S FOLD CHURCH INT’L. A Church based ministry with an expanding network of Churches, that began from the Republic of Benin, where the head Church is situated. Layo is passionately raising World Leaders that go on to repair waste cities. He is happily married to Nike Awojobi, a Jewel through whose eyes GOD sees the World. They are blessed with an amazing Princess, Zion. Together they make their home at Seme Podji in the Republic of Benin.